The results from the litter test are in - the new corn-based litter fails miserably to meet our needs! 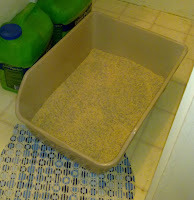 If you remember, at the end of July, I started trying out a corn-based litter in place of the clay-based. I never got as far as switching completely to the corn-based, am still running a half-and-half mix. I was trying to use up the clay-litter stock and was afraid if I used 100% corn, Theo would feast on it. The problems with the corn-based litter are many; the smell is yuck (even before the cats get near it), it gets tracked all over the house (much more so than the heavier clay), the cats kick a lot of it outside the box, even though we have the huge high-walled box (because it is a lot lighter-weight), it is still dusty (although less than the clay), and it is way more expensive. The chief potential benefit of the corn-based litter was the reduction in dust - so Willow could breathe easier. So, time to think about possible alternatives to meeting that goal.